Quick index link for: All Lead Free Solder Training programs. 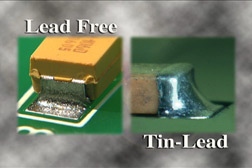 IPC lead free soldering training videos cover: the basics of hand soldering for through-hole components using lead free solder; the differences (in process and visual appearance) between making lead free vs. tin-lead solder joints; acceptance criteria for lead free solder joints; through-hole solder joint rework with lead free; lead free surface mount rework; the major mistakes operators make while soldering with lead free solder; lead free solder refresher courses; the importance of handling moisture sensitive devices in the lead free soldering process; and lead free surface mount assembly. A lead free image library containing 195 surface mount and through-hole lead free solder joint images can be used for developing your own in-house training program for lead free soldering. Here you can access Free Complete Online Reviews of our electronics assembly video training programs for Lead Free Soldering and Lead Free Hand Soldering. Use IPC EDGE for automated online training and testing.